One of the first signs of imbalance is fatigue. Unfortunately, most of us do not recognize this as an early warning sign. We reach for an extra shot of caffeine or sugar – or push through with sheer determination. 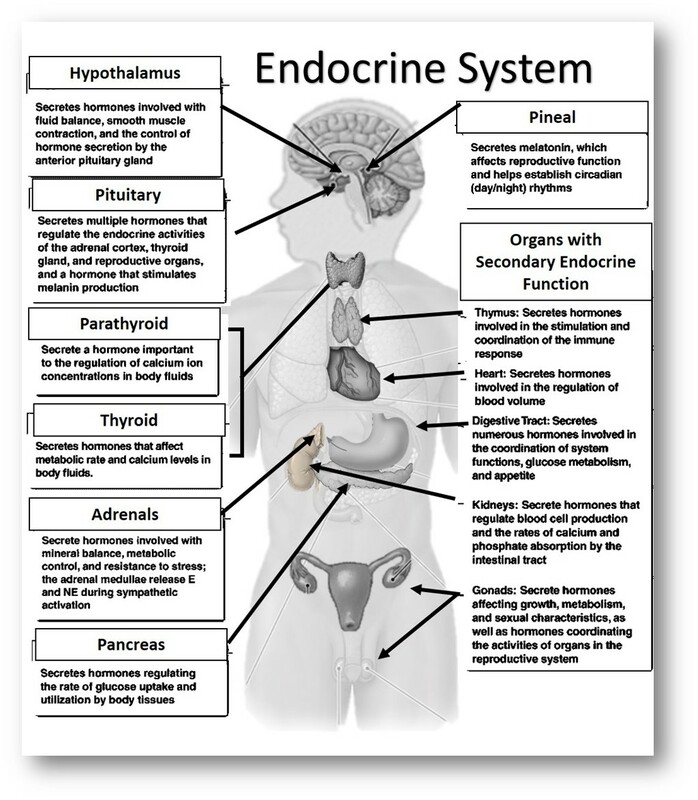 The Endocrine System is a series of glands that secrete hormones into the bloodstream. Hormones are chemical messengers that travel through the Circulatory system to change the activities of particular cells and tissues. As we learned earlier, prolonged stress is especially detrimental to the Endocrine System. In addition, digestive issues, especially “leaky gut” creates addition challenges. When there is a compromise of the digestive system and particles like gluten escape the gut system and enter into the circulatory system (before being adequately broken down), a cascade of inflammatory processes begin. The body releases antibodies to attack these foreign proteins (gluten proteins). Eventually the body may begin attacking itself – and an auto immune condition is born. Hormones are fat soluble and cannot travel through the blood stream, which is water soluble. In order for hormones to travel through the blood stream, the body attaches a protein to carry/piggyback the hormones through out the body. For example, the thyroid gland secretes Thyroxine – T4 – which is Tyrosine (an amino acid) and 4 iodine atoms. If your body attacks the Tyrosine molecule in T4, it will destroy Thyroxine and the process of creating Thyroid hormones will be affected. Hashimoto’s Thyroiditis (an auto immune condition) is a likely result. With a breakdown in the Endocrine System, many health challenges become difficult to overcome. Thyroid issues, such as we just discussed, can lead to a breakdown in the skeletal system.